Fresh, radiant-looking skin and a natural glow are part and parcel of looking younger. When your skin is luminous it seems to emanate from within, creating a vibrant, pure brightness others can’t help but notice. Many of us try to creatively achieve this look with makeup, but it can be even more beautiful when your skin reflects this radiance without any makeup. It all starts with brilliant skincare, so we’ll reveal how Paula’s Choice Skincare can help you achieve that dare-to-go-bare real healthy glow. An effective skincare routine includes a gentle cleanser, skin-replenishing toner, exfoliant, sunscreen that includes antioxidants, and a nighttime moisturizer loaded with antioxidants. But that’s just the beginning of lasting vibrancy. The additional products you use can play a significant part in achieving glowing results. Before we discuss the Paula’s Choice Skincare boosters, targeted solutions, or radiance products you can add to your routine, the role exfoliants play truly deserve extra attention. AHAs (like glycolic acid) and BHA (salicylic acid) work overnight to dramatically smooth and soften skin’s texture while banishing dullness—two key elements to attaining radiant skin. Routine use of an AHA or BHA product helps the surface layers of built-up dead skin to shed as they did when we were younger. The glowing result is that the newer, healthier skin that was covered up by the dead surface skin appears plumper, feels like silk, and has a bright luminosity. Then the skin brightening products you apply can deeply nourish skin with antioxidants, skin-replenishing ingredients, and restoring ingredients for enhanced results. What you apply after exfoliating but before your serum and moisturizer is the pivotal step that can reveal dazzling results. The products we encourage you to consider are our RADIANCE Renewal Mask, RESIST Pure Radiance Skin Brightening Treatment, and our C15 Super Booster. Vitamin C’s role in creating dewy, radiant skin comes from its ability to defend skin from environmental damage that causes dullness and makes skin look ashen or sallow. Vitamin C is a natural substance in skin that needs to be generously replenished in order for it to have a potent impact on skin’s appearance. When skin has an ongoing supply of topical vitamin C, it becomes renewed and revitalized, producing a luster from the inside out. Another product to consider for getting and keeping a radiant, supple complexion is our RESIST Pure Radiance Brightening Treatment. This sheer, skin-smoothing lotion contains a mix of skin-brightening niacinamide along with plant extracts celebrated for their ability to establish an even skin tone for a polished smooth surface. It also contains brightening minerals for instant radiance—perfect for those who want to see a healthier glow right away! One other product you may want to consider is our RADIANCE Renewal Mask. It’s a silky, rich, overnight skin-brightening mask that imparts a refreshed, luminous, and hydrated glow. If you have normal to dry skin, we think you will find this indulgent brightening mask provides the ultimate beauty sleep imaginable. It’s relatively easy to add the key products mentioned above to your daily routine for radiant results you’ll love seeing every time you catch your reflection in the mirror. 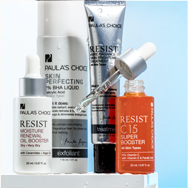 But the routine above isn’t just about brightening: You’re also getting anti-aging benefits, superior hydration, and specialized ingredients that create a visibly more even skin tone. We can’t forget to mention how astonishingly silky your skin will feel, too! Now when you opt to use makeup, it will amp up your lit-from-within healthy glow, so you’ll love the results even more (and makeup will apply much better). Expect lots of compliments on your skin!